Howdy! Wanted to share a quick little idea with you for creating magnets. My fridge magnets were really in need of an update since all the kids have left home – and it’s been awhile. I created a couple to start with that are a bit more my style than child-like. I was able to use up some materials I had stacked and stored (it’s always a good thing when you can decrease your stash!) which made me happy. 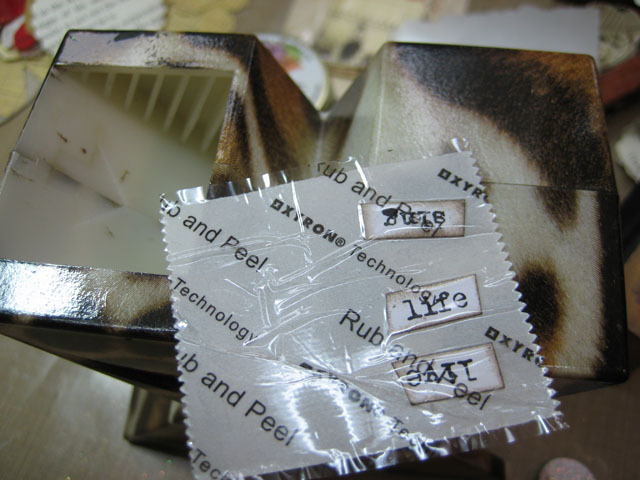 Whenever I cut dies such as the Sizzix Primitive Hearts or Sizzix Flowers, 3D, I save the extras I don’t use in a container. I started by gathering the smallest hearts and a couple of the cut flowers, some glitter, Xyron Magnet Tape, Gesso and printed words. 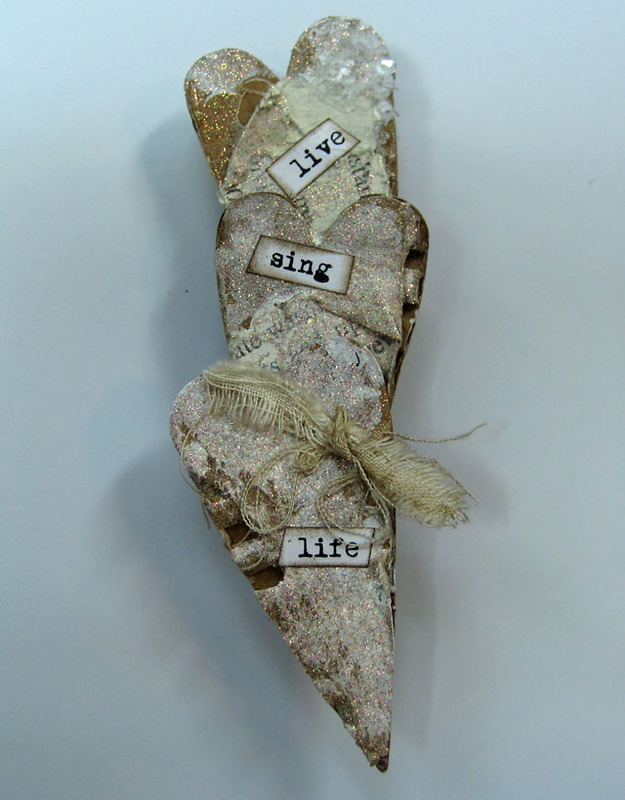 If you’ve been following this blog for a while you know how much I love my Sizzix Primitive Heart die, especially when cut from corrugated cardboard. I spritz the hearts with plain water so it’s easier to rough them up a bit. I ran some leftover scallop circles punched from old book pages through my Xyron 2.5″ Create-a-Sticker, roughed up a heart or two, blotted off some of the water and stuck the circles to the top of the hearts. The overhang is torn off. 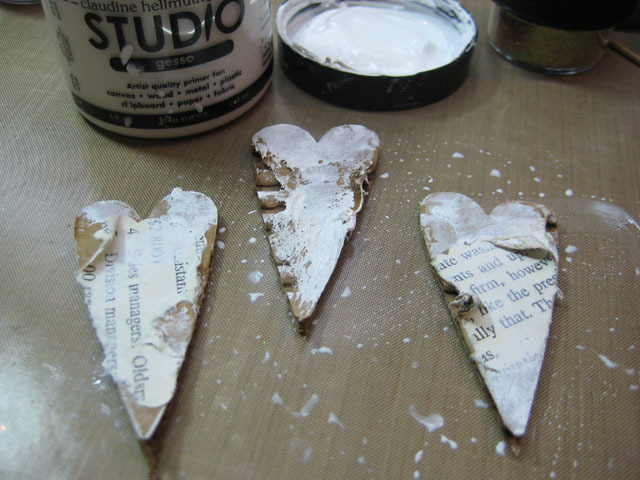 Dry the hearts briefly with a heat tool and finger paint them with a bit of Claudine Hellmuth Gesso. If the Gesso is too thick and you cannot see the book page words through it, just spritzed with a bit of water and use your finger to rub it around so it becomes a bit more translucent. 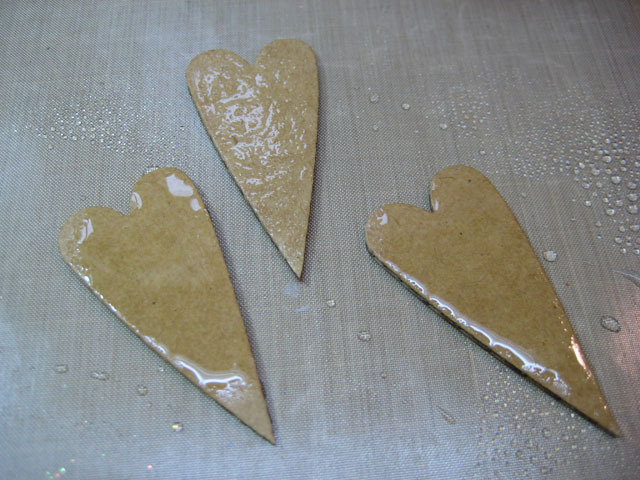 Rough the hearts up a bit more if needed and briefly dry them again. Process the hearts face-down through the Xyron 2.5″ Create-a-Sticker Maker. For a distressed look I do not rub the back or outline the edges of the hearts while they’re on the Xyron backing. 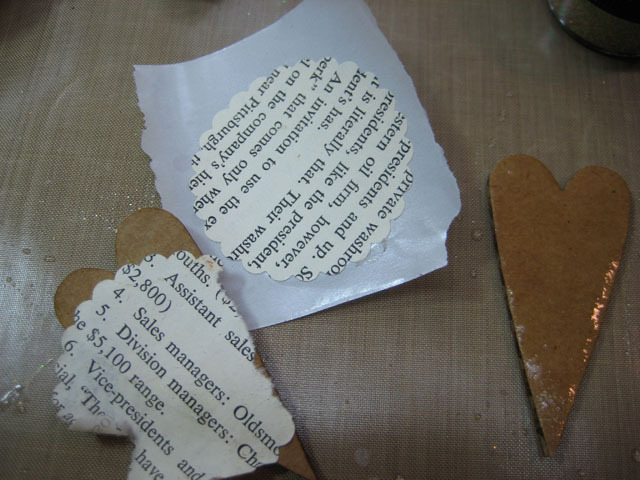 I tend to peel them off quickly so the adhesive is pulled off randomly and hap-haphazardly. The point here is stringy and missed spots. 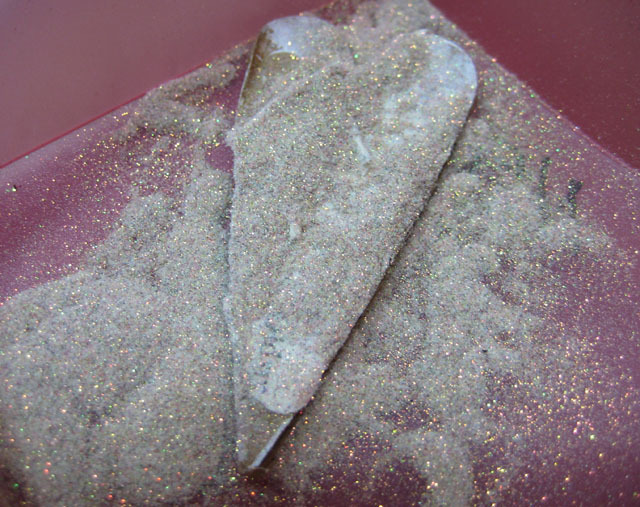 Place the hearts, sticky side up, in a glitter tray and sprinkle with Art Glitter #102 Mimosa Ultrafine Transparent Glitter. The transparent glitter allows all the texture and dimension beneath to show through – it simply adds a nice gentle sparkle. Cut some printed words or words from old book pages and process through a Xyron 1.5″ Create-a-Sticker and adhere to the hearts. 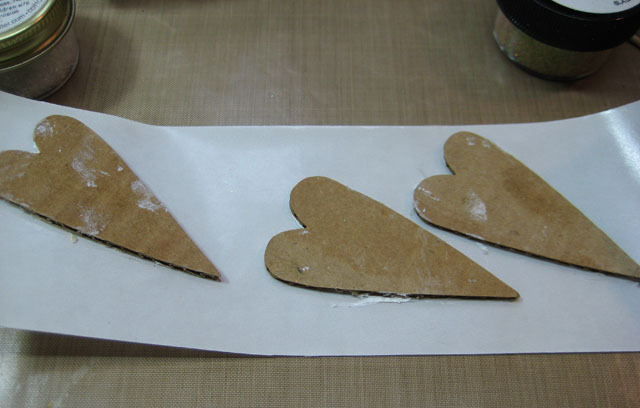 Adhere the decorated hearts to the top of the clip clothespins, overlapping as desired. Tie a knot in a small piece of dyed muslin and adhere to one of the hearts. 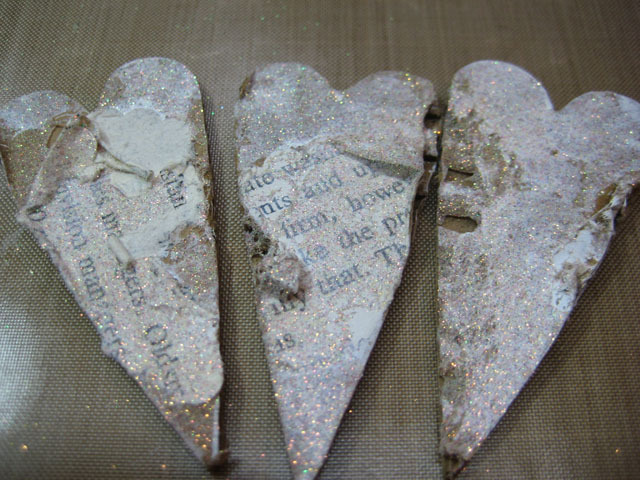 Add a bit of Vintage Glass Glitter #901 Krystallos Shards to the upper corner of the top heart. 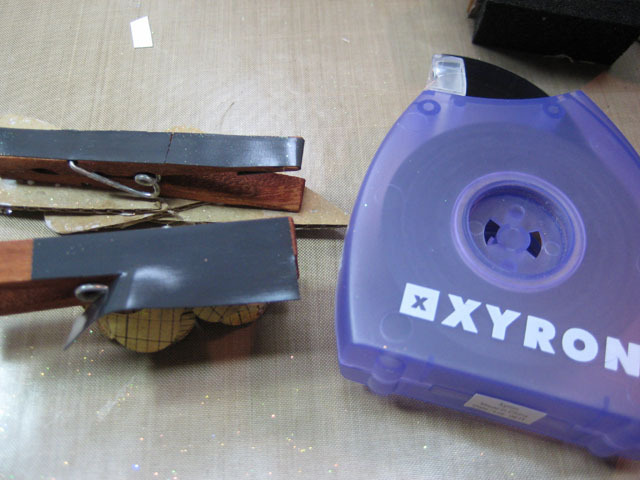 Zip off a bit of Xyron Magnet Tape and add to the back of the clothes pin. I simply sliced it to fit and used the remaining to totally cover the clothes pin. They look cute on the fridge and a bit more my style! 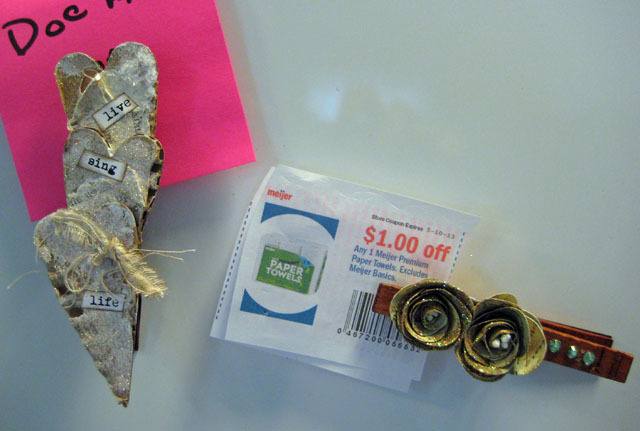 To learn how to make the flower magnet, click on over to the Art Glitter Blog for another tutorial. This is such a clever idea! Love seeing your ideas as always. Great frig magnets! And I love that they are on clothespins! Aren’t you the clever one! I love the magnets!! Much too beautiful for notes! Thanks for sharing.